Healthy Me, Healthy Family Workshop! Sunday! 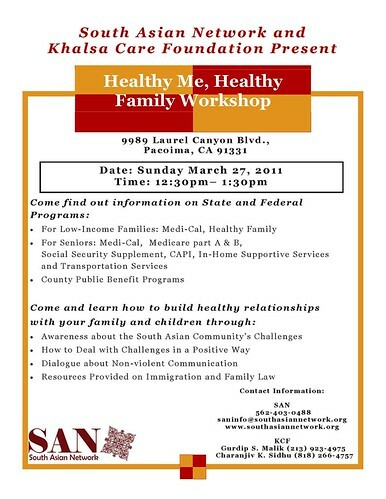 SAN’s AWAZ Voices Against Violence unit is holding a workshop this weekend with the Khalsa Care Foundation! Watch AWAZ’s new PSA, “Bedtime Stories,” here! The 60-second PSA focuses on preventing violence in South Asian families, especially families with children. It shows an everyday South Asian family reading the wrong kind of fairytale – a fairytale with violence - to their children.